This tattoo is about 10 years old. People constantly ask me why I have this word tattooed on my wrist, and I always joke that it is a reminder, that sometimes I forget to breathe and then I almost die. It’s funny, but it is sort of true. The real reason I got this tattoo was to remind me to take some time each day to pause, to meditate, to breathe. Focusing on the breath is a critical part of meditation and finding peace. Physiologically, it affects the way your body manages stress. If you are taking deep, long breaths, your body thinks it is in a calm state (even if it isn’t.) This in turn reduces stress and even pain. Stuff I learned in my biofeedback therapy for migraines! It’s science, people. 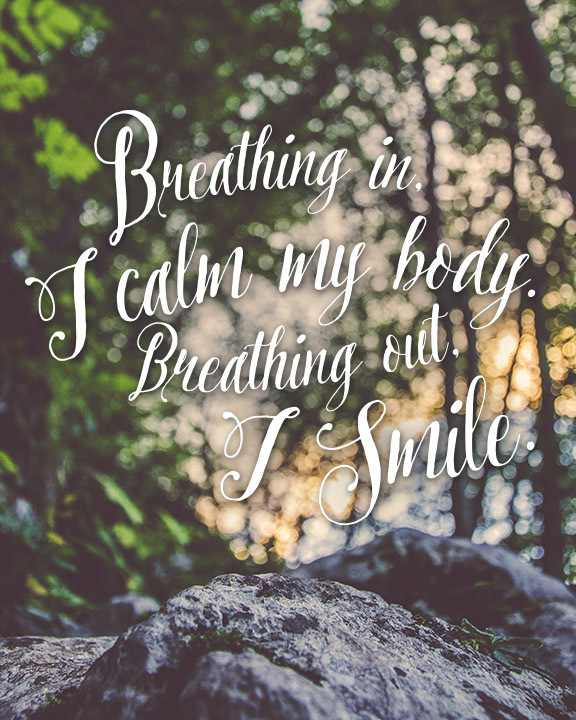 Take some time to breathe. Setting the tone for the week ahead. Quote by Thich Nhat Hanh.